The Walking Dead season 8 episode 6 review: Are there survivors from Terminus? Right now the person we are most interested in on The Walking Dead season 8 is Gabriel and that’s a sentence we never thought we’d write. Gabriel has gotten a lot of criticism over the years, but last week’s episode brought him to a place where he might have redemption. It seems that he’s infected with (possibly) the walker virus and he’s inside the Saviors camp. It might not be the way Gabriel thought he was going to help out in this war against Negan, but it might be the only way he can. With such a huge cliffhanger, we suspected that with The Walking Dead season 8 episode 6 we weren’t going to get much more on the Gabriel situation (resolution to that feels like a fall finale type episode), and instead we started this episode of The Walking Dead with an update of where we are in the war: The Kingdom lost everyone except Carol, Ezekiel and Jerry, Maggie has a bunch of Saviors as prisoners and Rick’s group still has Negan’s compound surrounded by walkers leaving them trapped. They have lost people in this battle, but for now they are in a good position and Rick thinks this will be all over in two days. After what happened to the soldiers from the Kingdom (and Shiva), Ezekiel is in a really bad head-space to say the least. Even though there is still more to do to fully execute the plan to take down the saviors, not even Carol can get him to come out of his house. Carol decides to go on her own to meet with Rick, but one of the Kingdom’s kids follows her and once again we have Carol in a situation with children following her around. This has been a constant theme over the years with Carol, that the more she pushes these kids away, the more they defy her to be with her. Carol brings the kid back to the Kingdom and has a talk with Ezekiel that is very raw, honest and makes us love this friendship even more than we already do. There’s a very special bond that these two have and every time they are on screen together we love them more and more. We aren’t saying that we are shipping them as a couple, just that they bring out different dynamics in each other that we haven’t seen. Ezekiel has been the King and Carol has been hardened, but together they are real. If you have been missing Michonne this season as much as we have, then you will be happy to see her in this episode. She’s a warrior that’s used to being part of the action and staying behind in Alexandria has been leaving her sir crazy – she wants to know what’s happening, wants to know that the plan is working, so Michonne and Rosita head out to check up on things. With a plan as elaborate as these three communities have put together, we were actually surprised that Michonne would leave Alexandria and risk everything that everyone is fighting for. Being on the road could lead to capture or death that could muck up the plan and send everyone right back under Negan’s rule. As it turns out it was a good thing that they went on this journey, because they ran into two Saviors that were MacGyvering a massive speaker system on the back of a truck in order to lure the walkers away from Negan’s compound to level the playing field again. Michonne and Rosita helped put a stop to that (with the help of Daryl and Tara who showed up last minute). We recently saw the character of Siddiq show up, begging Carl for food and water, but when Carl wanted to help Rick came in guns a blazing to scare him off. While it may be a different world and Carl may be hardened to a lot of it, something Siddiq said about his mother stuck with Carl. After searching for Siddiq to give him food and water, they finally cross paths, and Carl asks him the standard three questions they always ask newcomers. After bonding, Carl decides to bring Siddiq back to Alexandria. 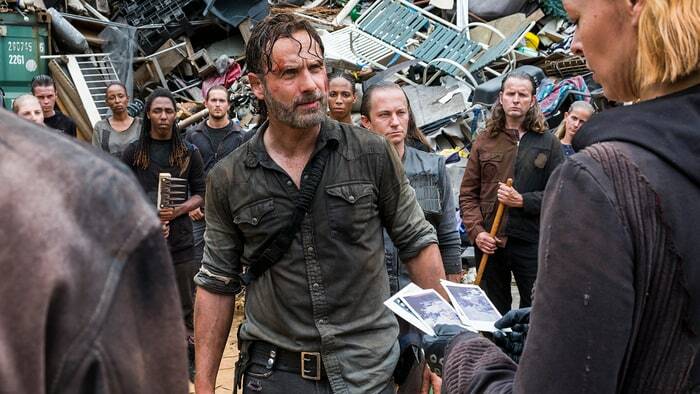 We haven’t seen the Scavengers in a long time (ever since they betrayed Rick last season), but Rick is at their compound looking to strike another deal. They are surprised to see him there after they shot him, betrayed him and killed some of his people – and to be honest we were a little surprised too. Rick may need them for part of his plan, but relying on this group to do anything other than betray him for a bigger, better deal seems like a bad idea. This tells us one of two things: That either Rick may be in a bit more of a desperate situation then we thought, or he needs to make sure that the Scavengers don’t muck up the plan if the Saviors are some how able to get word to them for help. We weren’t the least bit surprised to see them turn down Rick’s offer to join them, but when they put him in a shipping container and wrote a big letter “A” on it, we are reminded of a few seasons ago when Rick’s group was going to end up being cannibal food at Terminus. While this was mostly a filler episode where nothing really happened, seeing Rick in that shipping container with the big letter “A” on it sent chills down our spines. We know that Terminus is gone, but are all the people from that community gone? Have they started up again somewhere else and the Scavengers struck a deal with them? Even more interesting would be is if some of the Terminus survivors have merged with the Scavengers and this is the new community. There has been a lot of throw backs to storylines from previous seasons so far and it’s cool to see them intertwined this way. What did you think of tonight’s episode of The Walking Dead? Leave us a comment in the box below with your thoughts and hopes for the rest of the season. If you want to know what’s coming up next time on The Walking Dead then head on over to the link here where you can get a preview.